I am very happy for scientists to promote science education. I have been a fan of the ABC’s Science Show since Robyn Williams started broadcasting 41 years ago. I am excited by modern technology, and am happy to use its latest tools and gadgets. Science education can achieve what is claimed for it: clarity of thought based on evidence and the ability to evaluate and patiently work through new ideas. “The benefits of learning about science for young kids are enormous, says Kevin Squires, a teacher at Tamworth Public [School in NSW] who is employed especially to teach science at the school. “Science involves a lot of talking and listening to others; it develops patience, too – a lot of the time in science things don’t happen overnight,” he says. My problem with this advocacy is not that it isn’t true, but that it implies that education in the humanities does not provide students with equally powerful thinking skills. I spent a total of 10 years in tertiary education in the humanities. The courses (French Studies, Theology and Religious Education) may seem to have little in common, but the theme running through all my University studies was the close analysis of texts. Whether those texts were the Bible or Madame Bovary they all taught me how to use the evidence of words and ideas to gain insight in human behaviour. The key to success in the humanities, like science, is drawing conclusions from evidence. Studying languages and what people have written in them has many benefits for young people. Like science, language and literature develop patience because maturity and life experience will add to the meaning of texts. Like science, studying languages and texts develops puzzle-solving skills. Like science, the humanities develop a focus on the evidence. The humanities help students uncover human motivation and foster empathy. They give information and human context about other human cultures and faiths. It seems to me that the study of humanities, perhaps even more than the study of military theory, can contribute to the bringing about of world peace. It can certainly equip young people to be better husbands and wives, lovers and parents. Yes, studying science opens up exciting worlds and our world need scientists. But we need people who can read the human heart as well. Human consciousness: complete and inconsistent? Robin Craig’s “Philosophical Reflections” in TableAUS often provoke replies both polite and unmannered from Mensans. In these “Reflections”, Robin presents his highly rational and positivist world-view using the rhetoric of the philosopher. I enjoyed reading a new side of Robin in his novella Frankensteel. 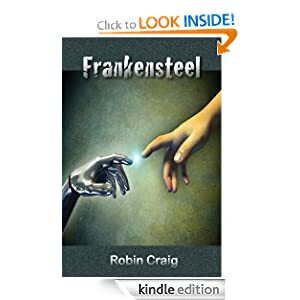 Frankensteel tells the story of an anthropoid robot equipped with an organic brain whose intelligence grows from a few simple learning algorithms. The robot at first appears unable to speak, however, but just the fact of its invention throws the authorities into panic mode. They order its maker Stephen Beldan to destroy it. Frankensteelhas quite a presence in a room, and its first spoken words are effectively a declaration to its maker that it would be inhuman to destroy it. Though the scientist locks the robot away, it inevitably escapes and seeks out the company of Professor David Samuels whose expertise in human consciousness may help it understand whether it is human or not. Special Investigator Miriam Hunter is ordered to hunt “Steel” down and finds herself drawn into the moral dilemma at the heart of this story: whether this human creation with its intelligence should be destroyed or not. The story has been told before. Any writer since Mary Shelley’s 1818 classic attempting a re-write of the Frankenstein myth must have a stand-out factor to distinguish it from its predecessors. Its factory setting and its police hunter skilled in dark arts of pursuit and assassinationgive Frankensteel a modern “industrial” and almost noir feel. The character of the professor, in particular, gives Robin Craig the narrative licence to develop arguments for and against artificial intelligence and its relationship to human consciousness. Frankensteel brings the old myth up to date bytaking into account recent developments, both in neuroscience and artificial intelligence. Set against these protagonists are the shadowy Imagist cult, believing that only human beings are made in the Image of God, and therefore set against machine consciousness. These radicals are capable of serious violence, but the robot uses his intelligent understanding of human beings to survive. Frankensteel is a novella length story which I read in a few hours. Its chief problem is that the characters are not sufficiently developed for me to care what happened to Frankensteel or any of his friends. It might be stronger if it was compressed to a short story length and then told through the eyes of just one of the characters, Frankensteel himself perhaps, so that readers both identified with his nascent humanity and were also drawn into the discussion about machine and human consciousness. But I salute Robin Craig for imaginatively raising the issues: I enjoyed meeting Frankensteel. Author Ted WithamPosted on September 11, 2012 Categories Book ReviewTags australian mensa, Book, humanity, Image of God, intelligence, literature, Review, science3 Comments on Human consciousness: complete and inconsistent?